The threat comes from solar storms, those occasional eruptions of vast amounts of energy that can cause a massive spike in geomagnetic activity and radiation. Self-driving cars are still working to master the snow. It turns out that excessive sun can also pose a problem for the coming wave of robot drivers. The threat comes from solar storms, those occasional eruptions of vast amounts of energy that can cause a massive spike in geomagnetic activity and radiation. While these storms aren’t immediately evident to human drivers, they can sever the data connection between a vehicle’s global-position system and the satellites that supply location information. That’s what could spell trouble for driverless cars now under development, at least if engineers aren’t careful. Scott McIntosh, director of the high-altitude observatory at the National Center for Atmospheric Research in Boulder, Colo., warns that self-driving systems should not be overly reliant on GPS when it comes to programming a 2,200-kilogram vehicle on how to get itself from Point A to Point B. In the event of solar trouble, legions of computer-driven cars would pull over and wait for connectivity to return. “There is a lot riding on this, from an actuarial point of view,” McIntosh said. “All it is going to take is a couple of accidents” and the industry will suffer. Solar storms are rated on a five-step scale, the biggest of which can cripple international power grids, knock out satellites and crush radio communication on the sunlit side of the Earth. McIntosh envisions a day when forecasts also include a synopsis of “space weather” so drivers -- both human and digital -- can account for these interruptions. Three years ago, the U.S. parked a satellite in deep space, 1.6 million kilometres up, and ordered it to engage in an indefinite staring contest with the sun. When solar storms are coming, the U.S. Space Weather Prediction Center acts as a warning buoy and gives a heads-up to utilities, airlines and other industries that rely heavily on airborne data. Generally, the Earth gets notice 30 to 60 minutes before the charged particles start wreaking havoc. In September, the system paid off. Airplane flights bound for the poles were rerouted when the satellite recorded two coronal mass ejections, one of which was rated a three on the severity scale. “That is the kind of game we are playing with civilization,” McIntosh said. The good news is that the sun is less mercurial these days. Its energy outbursts loosely follow an 11-year cycle, which last peaked in April 2014. The dawn of self-driving vehicles appears likely to coincide with a relatively quiet period. There are other potential solar trouble spots for driverless cars. Earth is in the line of fire of a series of coronal holes. Magnetically charged particles from the sun generally arc back to whence they came. A coronal hole is what happens when they don’t do that and simply blast out into the universe -- possibly at your robotic car. These events can have an impact similar to that of solar storms but usually aren't nearly as severe. The engineers behind automated vehicles, meanwhile, are already taking steps to outsmart the sun. Self-driving systems mostly base navigation on a field of sensors, including laser pulses known as lidar, that read the immediate surroundings and speak directly to the vehicle’s computer nerve system. More remote intelligence, such as the distance to the next interstate exit, is stored in high-definition maps that are regularly updated. That means that a Tesla relying on its Autopilot software or a Waymo vehicle shuttling passengers around Phoenix won’t need GPS to safely stay on the road. At the very least, in the event of solar disruption, there is enough redundancy for the car to calmly pull itself over and stop, said Danny Shapiro, senior director of the automotive unit at Nvidia Corp., which makes chips and artificial intelligence systems for Uber Inc. and a wide range of automakers. 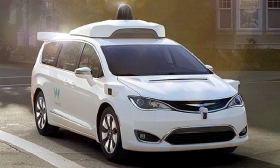 Automated vehicles can operate quite well, even when online connectivity is hampered.